Fluffy Buttermilk Chive Biscuits, an easy homemade fluffy buttermilk biscuits recipe! This quick fluffy biscuit recipe is from my new cookbook, Kid Chef Bakes, a baking cookbook for all ages! 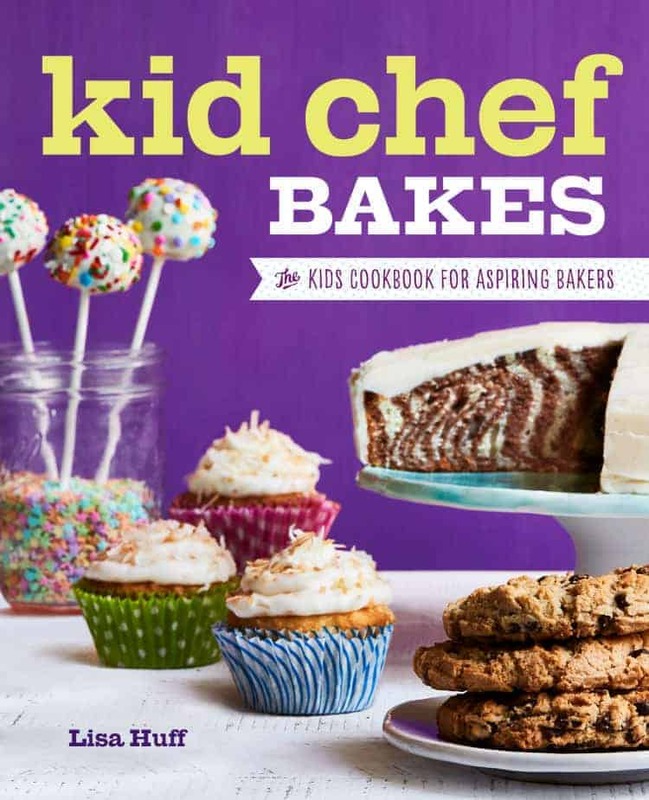 My cookbook, Kid Chef Bakes, will be out next week! Yay! So today, I thought I’d share one more recipe from the book, Fluffy Buttermilk Chive Biscuits! You can see more info about my cookbook, Kid Chef Bakes on Amazon and PREORDER NOW—> Kid Chef Bakes (<—link to see all the details on Amazon!) 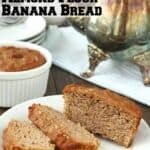 Be sure to check out the other recipes I’ve posted from the book including Mini Blueberry Peach Crostatas, Blueberry Muffin Tops & Cheesecake Drizzle, Lemon Loaf Cake, and Soft Pretzel Sticks with Honey Mustard Dip. Special deal for you today too! 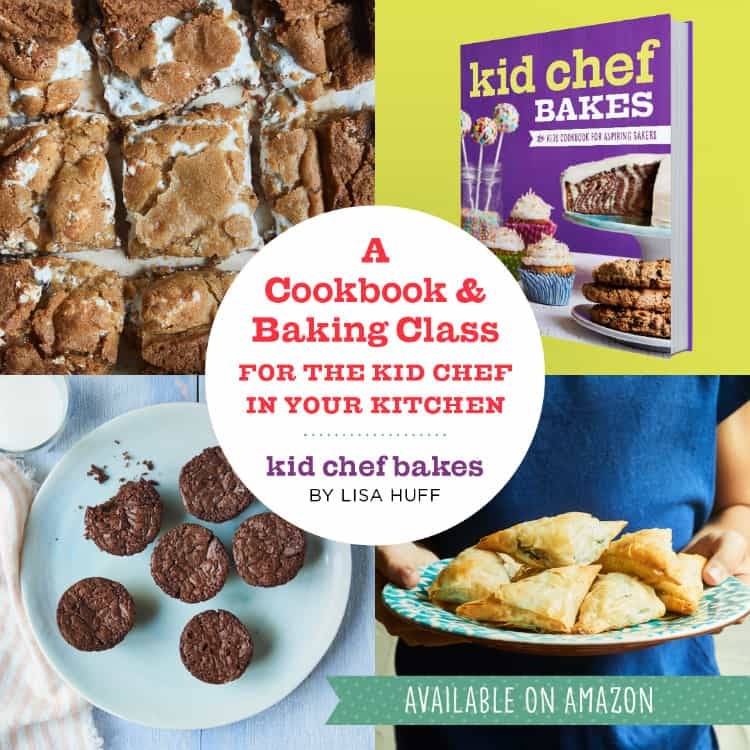 If you order Kid Chef Bakes on Amazon before October 31, 2017 use coupon code 2KIDBAKES to get $2.50 off. Feel free to share with your friends and family so they can save too! I love these quick Fluffy Buttermilk Chive Biscuits! I wish I had some of these warm fluffy buttermilk biscuits right now! 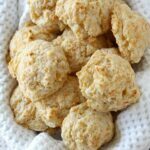 This recipe for homemade biscuits is easy enough for kids to make, but delicious enough that you’ll be making them too. Wondering how to make fluffy biscuits? 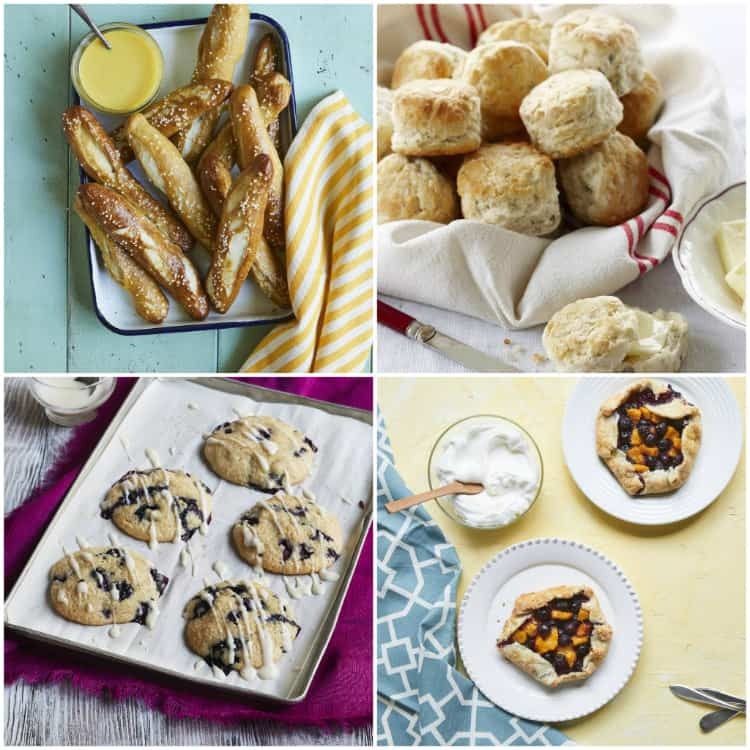 Well, you’ll have this easy biscuit recipe and more fun recipes in Kid Chef Bakes. 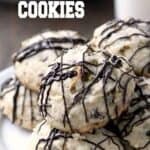 The cookbook has 75+ recipes with a variety of sweet and savory recipes for such things as cookies, cakes, pizza, bread, pies, pastries, and more! Although the book was written with kids aged 8-13ish who are learning to bake in mind, the recipes are delicious and perfect for adults too. 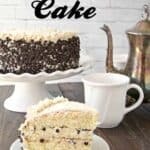 The book has 75+ recipes PLUS many baking tutorials, baking tips, must have tools and supplies, and more! 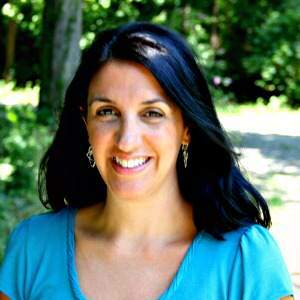 I even shared a few of my most embarrassing cooking stories! 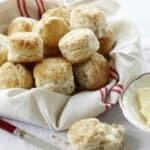 How To Make Fluffy Biscuits? 1. Preheat your oven. Preheat your oven fully before placing the biscuits inside. Check your oven temperature with an inexpensive oven thermometer as well if you think the temperature may be off. 2. Start with the best and freshest ingredients you can. Be sure your flour and baking powder (or for some recipes, baking soda) are all fresh. 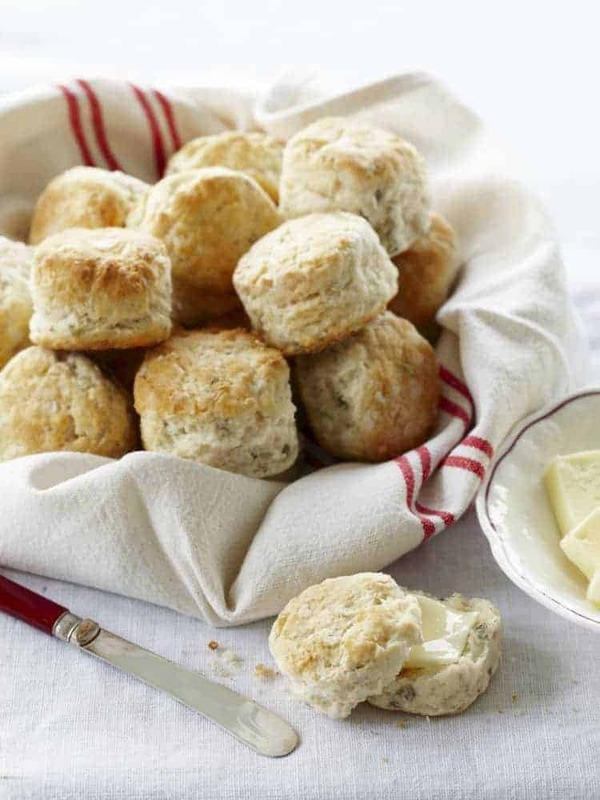 Old baking powder and baking soda may prevent the biscuits from rising as much as they should, and you won’t get those fluffy light biscuits. 3. Keep your ingredients cold. Keep as many of your ingredients cold as you can, especially the butter and even the buttermilk until you need them to mix into the bowl. You want the butter to melt in the oven to form little pockets of air while the biscuits are baking. 4. Don’t overwork the dough. Don’t knead the dough or roll the scraps of the dough out more than once if you can avoid it. Overworking the dough will yield tougher biscuits. 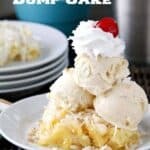 Biscuit recipe with All Purpose-Flour? I lived in the south for about 5 years and couldn’t get enough of those yummy Southern biscuits! Many Southern biscuit recipes contain self rising flour that can be difficult to find elsewhere. 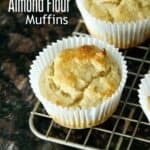 To make this simple biscuit recipe so that people wouldn’t have to track down self rising southern flour, I used all-purpose flour and baking powder. Don’t worry though, this biscuit recipe with all-purpose flour is still delicious and yields the best fluffy biscuits from scratch! To start this homemade biscuit recipe from scratch, preheat your oven and grease a 10-inch cast iron pan with butter. Make sure your oven rack is at the lowest level if you want your biscuits nice and browned on the bottom. If you don’t have a cast iron pan, you could use an oven proof skillet or baking sheet. If you don’t want crispy biscuit bottoms, you can also bake these biscuits in the middle of the oven. Mix the dry ingredients, all-purpose flour, baking powder, and salt in a large bowl. Then with a pastry cutter, cut in the COLD butter cubes until the mixture looks like coarse crumbs. Again, make sure your butter is COLD. You can even use frozen butter cubes or grate a frozen butter stick. When cutting in the butter, a pastry cutter will make things a lot easier for you, but you could also use two knives or the back of a fork. When the mixture looks like coarse crumbs, stir in the fresh chopped chives. Instead of chives, you could use all sorts of things like chopped bacon/ham, shredded cheese, or precooked chopped onion. Or use a combination of a few things! Add about 1 cup of buttermilk to the bowl and stir adding a little more buttermilk as needed until the dough JUST comes together. Flour a large work surface, and gently press or very gently roll out the dough until it’s about 1 inch thick. Use a 2-inch biscuit or cookie cutter and cut the dough into 16 biscuits. Put the scraps together to get more biscuits, but don’t overwork or knead the dough. Push the cutter straight down and lift straight up when cutting, trying not to twist the cutter. You may get more or less biscuits if you use a different size biscuit cutter. If you do use a different size biscuit cutter, be sure to adjust the baking time. Place the cut-out biscuits in the cast iron pan and bake until they are golden brown. When they’re done, brush a little melted butter on top. Hope you enjoy this recipe for homemade Fluffy Buttermilk Chive Biscuits! 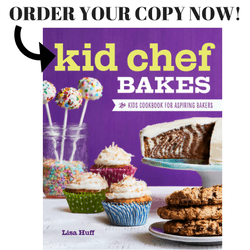 For 75+ other great recipes, be sure to reserve your copy of Kid Chef Bakes today! Fluffy Buttermilk Chive Biscuits, easy homemade fluffy biscuits that you make from scratch. Preheat oven to 425 degrees F. Set the oven rack at the lowest level. Grease a 10-inch cast iron pan with butter. Mix the dry ingredients. In a large bowl, mix together the flour, baking powder, and salt until combined. Cut in the butter. Using a pastry cutter or back of a fork, cut in the 6 tablespoons of cold butter, until the mixture resembles coarse crumbs. Stir in the chives. Add the wet ingredients. Add 1 cup buttermilk to the flour mixture. Stir to combine, and add more milk as necessary until the dough just comes together but is still moist. Be careful not to overwork the dough or the biscuits may come out dry. Form the biscuits. Place the dough on a floured surface. Gently press the dough until 1 inch thick. With a 2-inch round cutter, cut the dough into 16 biscuits. Bake the biscuits. Place the biscuits next to each other in the prepared pan. Bake on the bottom rack for 12-17 minutes or until golden brown. Brush with the 3 tablespoons melted butter. Cool slightly before serving. SNAPPY TIPS: Be sure to keep your butter cubes and buttermilk as cold as possible before mixing them into the other ingredients. If you don't have a cast iron pan, you can also bake these biscuits on a buttered sheet pan. SNAPPY SUBSTITUTIONS: Instead of chives, you can use chopped cooked bacon, shredded cheese, or even chopped precooked onion. Biscuits are my kryptonite! I love them! Buttermilk and chive sounds divine! These look so delicious. I love me a great biscuit so I’ll have to make this recipe real soon.